Doc Brown himself recently lied to us about the existence of hoverboards. 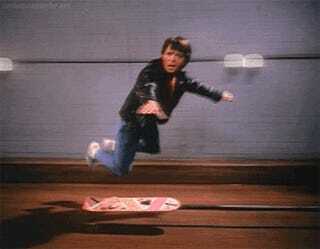 But if you've got the cash, an original hoverboard (albeit, still non-hovering) could soon be yours. One of the original hoverboards used in filming Back to the Future: Part II will be going on sale this fall and it's expected to fetch a pretty penny — or pretty pound, as it were. This retro-futuristic artifact will be going on display in London this October, then auctioned off to the highest bidder. There were two kinds of hoverboard props made for the film: cheaper styrofoam props and more solidly constructed wood ones. Given that some predict this particular hoverboard could sell for as high as $25,000, this is expected to be one of the latter. It's unclear precisely how many original hoverboard props there are floating around out there, but you'll generally see them pop up for auction every couple of years.